It is with great anticipation and joy that I announce our third Letters seminar, being held this Sunday January 13th, at the Starheart Farm in Big Pine, NC. For all of those who have signed up for this event I am posting the day’s information below. Robert, Judy and I look forward to seeing all of you and communing together with this most important work. Be prepared to be moved to a new level of resonance and experience in a world that is waiting our presence. See you there. 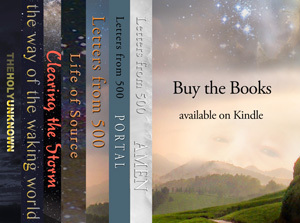 A four-hour dialogue about the messages in the “Letters from 500—Portal” material—Book Two of the trilogy. This seminar is about portals into destiny—your destiny, our group destiny. The practice we will employ, without a strict agenda, will be dialogue amongst ourselves and our souls, triggered by periodic guided hypnotic meditations, accompanied by inspiring music. We will allow the soul to enter us through the portal we create together. Then we will speak amongst ourselves, with inspiration. Our own words will inform us; that is to say, our words will be the vehicles for our souls to bring spirit into matter, formlessness into form—to inform us. During our dialogue and inner journeying, we will enter the Void and establish a firm link to our “new universe”—the awakened universe—where a part of our awareness is already being born, where it is now maturing and does reside. By this means, we will place one foot in the ‘new’, and retain one foot in the ‘old’. Thus will we become energetic bridges to awakening, for ourselves and others. Through all this, we are taking a sacred journey into our collective future, which is to say, into Now. Only the intensity of Now—pure, simple and infinitely profound—can generate the energy and spirit we need to step through these portals and to create the bridge. O has guided me to suggest reading pages 99 through 101 in Letters from 500—Portal to get a specific idea of the nature of our dialogue. The reading is listed at the bottom of this itinerary. Finally, out of our small group engagement, we will become a radiant center of silent inspiration, holding the space open for many, many others to find their own ways through the portals that are opening in and around them throughout the world. A small group of participants, including Robert Potter, author of the “Letters”, Stefan Bright, blog author, producer and photographer, and Judy Welder, editor and hostess of the farm. I sense you smiling, “I thought you might ask me that. The great game we are playing here is the emptying out of the soul. The aspect of the soul that faces into duality carries much baggage from the past. I speak here, not of the oversoul, or the greater Ego, but of the localized conditional soul. This is where karma accumulates—as the soul breathes Life into its repeated forms on Earth. Allow me to explain. “What’s important here is the breathing. The soul’s breathing is the means for clearing karma. Our forms take on esoteric emptiness as the soul breathes back its essence from our forms. This is what we experience as stillness. By emptying the vessel of incarnation—the little self—we prepare the way for deep presence to arise. The Void is that presence. This is the practice of stillness—feeling the soul’s in-breath. “I can only suggest, for now, that you feel what I’m saying, rather than understand it; jump over the mind for this. Reach out with your ‘other’ awareness—through the stillness. Breathe out to your fellow humans. Use your energy body to find the wholeness in you, and reach out with it into the wholeness of your species. Use the breath to link your essence with that of other like souls. For now, let it sink—through forgiveness—into your heart. Note the relationship between lungs and heart. You will eventually know what I am saying. “Very good questions. The answer is ‘yes’ to the first two. There are those who will join you in the passage without creating their own individual portal, and without releasing the ego contract. Not many humans can actually accept the grace of freedom yet. Their genetics will have to transmute first. Next Post: Where Do We Go From Here…?